are the best way forward, right? I admit that navigation and sense of direction are not my fortés, but I felt that I could probably easily manage a motorbike in Bali since I am used to motorbiking in the Land of the Craziness of Bikes, Vietnam. Our first night we asked our hostel about renting bikes, and were told that the bike rental lady would be over at 9.20am. Perfect – not too late, but late enough for us to catch up on sleep a little bit. Next I got to try the bike. Literally with nothing on me apart from the random clothes I threw on before going to meet her, I got to drive in Bali's left-sided traffic around squiggly streets I had never set foot (or wheel) on before. I was acutely aware that if I got lost, I had no phone, no map, not even money. It was quite surreal but a very... envigorating experience. I'm in Bali, on my bike, it's 8.30am, with a whole day – many days! - ahead of me! Today's destination was inland, the cultural centre of southern Bali, Ubud. Known especially from the book/movie Eat, Pray, Love (which I haven't seen/read, unfortunately), it's known for its art, culture and handicraft. It was a relatively easy ride – driving on the left side was much more... easy than I'd thought. I learnt quickly that Bali is also a bit more rule-abiding than Vietnam. In Bali, the traffic is crazy, and the Balinese know that, and try their best to make it less crazy – the road work signs reminded everyone about safety, and people actually kept to the lanes assigned to them. Whereas in Vietnam, I feel that people have completely given up (well, can you give up something you've never started??) trying to make things safe - it's crazy, deal with it. Finally we gradually arrived in Ubud. 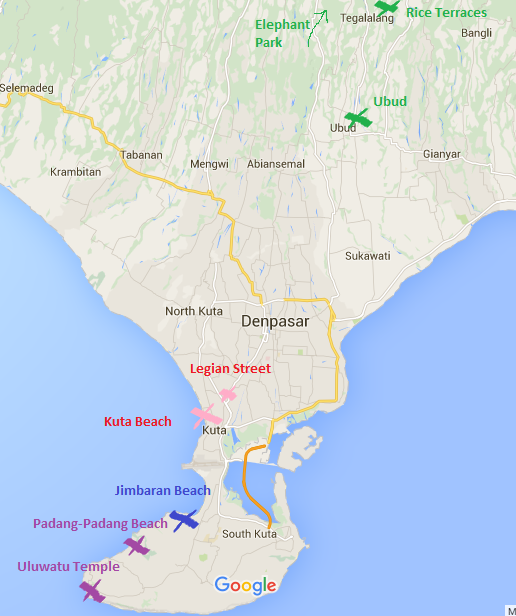 Despite attempted research, in the end we didn't really know what there was to do in Ubud. Yes, cool arty shops and narrow streets (which were not fun to drive, btw, the cars attempting to squish you off... Excellent balance practise. ), but what to do? We parked near a tourist info stall, near other bikes, but still making sure the bike was always visible. We went to talk to the friendly dude in the info stall. “What to do in Ubud?” we asked. He explained we should just head north towards Tegalalalallang (ok, so not that many lala's, but something like that), a village north of here which we'd heard of, but deemed perhaps too far away. “Just go in one direction,” he said, “like the boyband.” We (I) liked him instantly. She did enjoy shopping, promise! After a quick stroll around the Ubud streets, we jumped back on our bike and headed in that one direction. It was a beautiful road full of ups and downs. We drove through Tega, which wasn't massively exciting tbh, lots of cool art shops though. Until, we stumbled upon something beautiful. Ah, the famous Rice Terraces we'd heard of! We crossed our fingers and parked somewhere which hopefully was both legal and safe, then went off to explore. There were lots of tourists, but not too many I'd say. There were many pushy salespeople nearby, but luckily the ones in the rice terraces themselves were mostly pleasant and the majority were very cute old men. For example this Mr here, who was eager to pose in pictures and didn't even hint at money (we gave him some, though). There were two spots where people tried to charge us for 'maintenance of the rice terrace paths' – the first one I happily paid, the second one not so much. They were not happy, but let us pass, but refused to let the French couple behind us pass without paying... Dunno how that one ended. Another cute one was an old man with a wooden pole over the path, with a sign warning of the dangerous bridge which also needs maintenance fees. We gave him 10,000 and he was very happy. And the bridge was very cool. At the Gangnam Style café on the terraces we contemplated our next moves. I really didn't want to do the famous Monkey Forest as Indonesia was currently known to be battling a rabies outbreak. We decided to set off finding this random ridgeway walk thing. On the way, however, we saw a sign to a place we'd read about but not actually found on the map: Elephant Park! The sign said either 1km or 7km, it ended up being the latter. For a few days we thought Hati-Hati meant elephant... It doesn't :( BUT WOULDN'T IT BE THE CUTEST!!! Elephant Park was soon on after that. You could do elephant riding, which I preferred not to do, or just walk around the park. The first thing you saw was a sign telling you why, despite the elephants being chained in the park, that they are happy and this is necessary. Next step was signing a form more or less saying that I accept I may die of being stamped on by an elephant. Then payment, then into the park! I love elephants, but this was especially exciting for Nikki, who hadn't seen real elephants before. We got pics with an elephant and got to see the only free elephant, the Baby <3, who tried climbing over the fence to get leaves which in the end he poo-pooed. So, when we finally chanced upon a shop that seemed to be selling clothes, we happily bought ourselves a beautiful Chanel hoodie with fuzzy bits (for me) and a beautiful neon green jumper with a Union Jack on it (for Nikki) and made the ladies in the shop very happy. Hiccup #3: Our road randomly ended abruptly with some steps and a rock. It was kind of reassuring when we checked googlemaps to realise that we had actually gone the wrong way, not that we were expected to go this way... In all fairness, the road had been a little bit suspect for a while, with its crazy uneven bumps and very lacking road maintenance. So, we turned round and headed back. Hiccup#4: Petrol was running very low. If you're outside of central Kuta, the only way to get petrol is to stop at a shop selling petrol in adorable old vodka bottles for about 10,000 (75 centsish). So, it was a godsend when we went round a corner and saw a shop with a light on. We wandered around the shop selling bits and pieces from food and bike parts to toiletries. After a few confused moments of being in a completely empty shop, a beaming lady of about 50 appeared. She was more than happy to sell us petrol, and seemed sad we weren't staying to sit down with her. Then, bye-bye to our Angel Lady, and back on our way. If you ever find yourself on the backroads of Bali, do pop in! Hiccup #5: My phone battery was running out... Luckily, it finally died only on the edge of Kuta, and I was quite proud of myself for navigating back to the hostel without a map! Ah googlemaps, you saved our lives many times. And infuriated it a few times as well. Absolutely shattered after the trip, but it was lovely. I absolutely love driving a bike in Bali, the roads are so exciting and curvy and uppy and downy and... SO COOL. Why is it that baby elephants have that cute fluffy hair on the tops of their heads? That cutifies them even more! That is a good question mumsiekins! What language did you use in Bali, English, I suppose? How could you have passed such an earing stall without buying some? Ah, the backwards yellow cap you told us about! You call that a Union jack, though? Not quite… Your petrol shop in the middle of nowhere reminded me of the time we were driving back to Aberystwyth and stopped at a little shop in the middle of nowhere and he put the tea machine on especially for us (but we didn’t by vodka bottles of petrol though). FANTTI!! !<3 they were so so so cute! I want one.. We had looong way back to the hostel but still it was so funny when our road just ended lol:--D I can remember so lively (can i say so..?) how COLD there was... And you just laughed at my leather jacket in vietnam, so I left it there... Angel lady was lovely<3 and she was at the right place at the right time. She saved us. - nikki(: PS love my yellow cap<3 i know you loved it too(; just admit. Is it only anonymous people who have to prove they're not a robot? I don't need to and so I miss the fun pie selections, etc!